Hiya guys! I'm so excited to finally be able to share these swatches after the horrible week I had. Not only did my cell phone break, but also my camera. Yup, the camera I use for swatching. To make matters worse, the replacement was sent to the wrong address. Needless to say I spent an entire day with customer service on the phone. So I'm quite behind on swatching, but thankfully everyone has been super patient with me (which I cannot thank them for enough). But enough of that, it's time to get to the polishes! Today I'm sharing swatches for the Cotton Candy Mattes Collection from Contrary Polish, which consists of four gorgeous medium pastel shades. Fair warning, this is a photo heavy post as I'll be showing which each shade looks like in matte and glossy. Let's get to it! 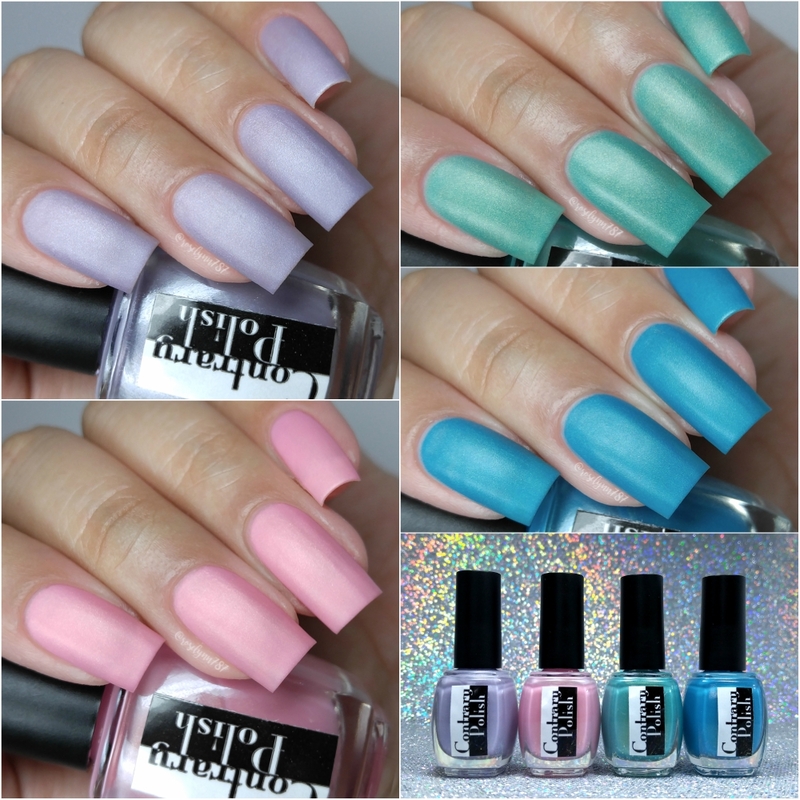 The Cotton Candy Mattes Collection from Contrary Polish is now available for purchase. Each full-size bottle retails for $10 or the mini-size for $5. The complete full-size collection can be purchased for $36 or in mini-size for $18. Grape can be described as a matte greyed lavender with fine silver shimmer. I wasn't sure at first about this shade, but after seeing that matte finish it made me fall in love. It's quite stunning, especially for this season. The grey undertones make it stand out in the sea of lavender that is popular this time of year. The formula has a sheer application, but builds-up evenly on the nail. It has a great consistency, not too thick or too thin. Very smooth and easy to work with and dries at a pretty quick pace. Shown here in three coats and without a topcoat. Pink Vanilla can be described as a matte cotton candy pink with fine gold shimmer. Not one of my favorites in this collection for my skin-tone, but I do love the color itself. It's one of those shades I am very envious that I can't pull off that well. But that said, you know I'll be wearing this one regardless. I mean hello? It legit looks like cotton candy on your nails aka one of my favorite guilty pleasures, haha. The formula has a sheer application, but builds up really well on the nail. Although it does show a bit of a visible nail line in person, it's very faint and not obvious in these photos. Shown here in three coats and without a topcoat. Green Apple can be described as a matte minty green with fine gold shimmer. Brace yourselves to be shocked... this one is actually my pick for must-have. Yes, I have actually picked something other than purple or blue for once haha. This shade is by far one of my top favorites, not only from this brand but actually this year. It's a very unique shade of green that I think will look fantastic against any skin-tone, which I feel doesn't happen too often. The formula, like the others, has a sheer application that builds-up well on the nail for full-coverage. It has a nice even consistency, not too thick or too thin. Very easy to work with and layer. Shown here in three coats and without a topcoat. Blue Raspberry can be described as a matte turquoise blue with fine green shimmer. The formula has a similar sheer application like the others. It did tend to have a thinner consistency, though it was perfectly manageable and not runny. It builds up really well and has a nice pigmentation after layering. And as a note, I'd like to mention I experienced no staining on removal neither to my nail bed or cuticles. Shown here in three coats and without a topcoat. Overall I am really loving all the matte collections coming out this season and this one is no exception. The colors are really gorgeous and feel diverse after being topped off with a glossy topcoat. It's always nice to know a shade can be rocked with either and still look equally as fierce. As for must-have picks, I have to give my heart (and soul) away to Green Apple. Although Blue Raspberry comes a close second favorite and I mean really why have one polish be your favorite and when you can pick two, haha. Those are my picks, now tell me which ones are blowing your mind away? To recap, the Cotton Candy Mattes Collection from Contrary Polish is now available for purchase. Each full-size bottle retails for $10 or the mini-size for $5. The complete full-size collection can be purchased for $36 or in mini-size for $18. These look so yummy!! Blue Raspberry reminds me of Sour Punch straws...blue is my favorite! This is a beautiful collection! I love being able to buy the smaller bottle size from Contrary too! I get that these are meant to be matte, but I'm really loving them glossy!